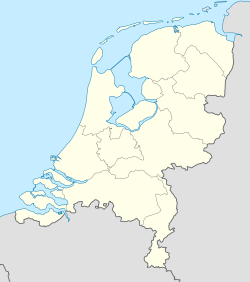 Lieutenant General Best Barracks (Dutch: Luitenant-generaal Bestkazerne), formerly De Peel Air Base (Dutch: Luchtmachtbasis De Peel), is a Royal Netherlands Army guided missile base in the Netherlands. It currently has only one, though not actively used, runway. Open Street Map of the base. In June 1944 the German Luftwaffe constructed the first airfield near the town of De Rips, consisting of a single 1400 meters long and 75 meters wide grass strip. The airfield did not see much use by the retreating German forces and was later briefly used in October 1944 by the Royal Canadian Air Force 126 wing as an Advanced Landing Ground (designated B-84). It was not located on the site of the current air base, but about 8 kilometers to the north-west of it. There are no visible remains of it today. The air base was founded as a diversion airfield in 1954 with two parallel runways (06L/24R and 06R/24L) and never served as an active base for aircraft, seeing only incidental usage from the aerial photo reconnaissance unit from nearby Volkel Air Base, even though the base was expanded in 1973 for possible NATO use. In 1993 it was closed as an operational airfield and became the home base of the Royal Netherlands Air Force guided missile division (Groep Geleide Wapens, or GGW). One runway remained however, though it is no longer actively used by the military. The base is used for glider flying however. Military aerial exercises also take place in its airspace. In March 2012 it was decided as part of a reorganisation to transfer control of the base from the Royal Netherlands Air Force to the Royal Netherlands Army, resulting in a name change to Lieutenant General Best Barracks (Dutch: Luitenant-generaal Bestkazerne). However, it is still commonly referred to as De Peel. Provides logistical and communications support. Provides training for both national and international ground-based air defence units. ^ Abandoned & Little-Known Airfields - Noord Brabant, the Netherlands - De Rips Archived 2012-09-01 at the Wayback Machine, article retrieved April 10, 2013. ^ Aeronautical chart as an example of continued usage of De Peel: Skyvector.com - Aeronautical Chart of the Netherlands, map retrieved April 10, 2013. ^ Defensie.nl - Defensie Grondgebonden Luchtverdedigingscommando - Eenheden Archived 2013-04-02 at the Wayback Machine (Dutch), article retrieved April 10, 2013. This page was last edited on 20 May 2018, at 01:30 (UTC).